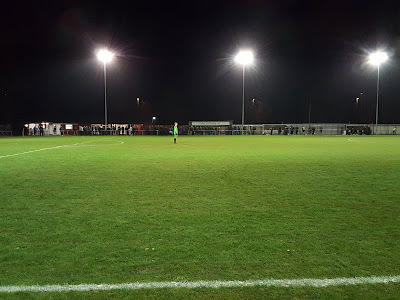 My fourteenth ground of 2019 was on Tuesday 19th March at the Bypass Ground in Romsey, Hampshire. 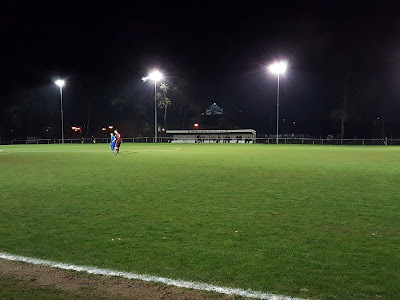 The match was Romsey Town vs. Verwood Town in Wessex League Division One. The Bypass Ground is on the southern edge of the town of Romsey. Unsurprisingly given its name the venue is adjacent to the A27 bypass road which runs past the northern and eastern side of the ground. There is green space to the west and to the south more sporting facilities in the form of a leisure centre, cricket pitches, Romsey Tennis Club and Romsey Rugby Football Club. The ground is half a mile south of the town's railway station and has been the home of the club since 1956. The entrance to the venue is in the north-west corner and by this is a slightly dated clubhouse with an outdoor food outlet next to it. For spectators the northern side is mostly uncovered standing though there is a covered standing area just to the west of the halfway line. Beyond this are the two dugouts with the uncovered standing continuing to the end of the pitch. The sole seating area is provided on the opposite side of the pitch.This is an unusual stand consisting of four rows of separate wooden platforms built in slightly ascending height order. Plywood partitions split the stand into three sections in line with the girders which support the roof. The rest of this side has a layer of hard standing with a fairly large area of grass at the back. A covered standing section takes up the middle half of the eastern end of the ground with uncovered standing either side of this. The western end is uncovered standing - due to the large trees behind this end is the most space restricted at the venue. Romsey Town were having a good season in the Wessex League and with an outside chance of promotion knew they had to win to keep up their charge for the second potential promotion spot. Verwood on the other hand came into the evening in 9th knowing full well they would have another season of Division One football to look forward to. It was a fast paced start to the night with Romsey edging it. They were close in the 14th minute when James Clifton headed over from close range. In the 23rd minute the opening goal arrived - some nice play by Liam Mager on the edge of the area beat a defender and he poked the ball through to Clifton who shot across goal into the bottom corner. In the second minute of first half stoppage time the hosts netted again with a similar goal to their first effort. Zac Mouland picked up the ball on the left side of the area and drilled a shot through the keeper's legs into the far corner. It got better for Romsey in the 63rd minute with goal number three being scored. Some nice play around the area resulted in the ball going out to Mark Fawley on the right. He had two defenders for company but quickly turned and shot low, the ball squirming under Sam Thompson who should have done better. Verwood at least started creating after this and almost grabbed a goal back in the 68th minute. 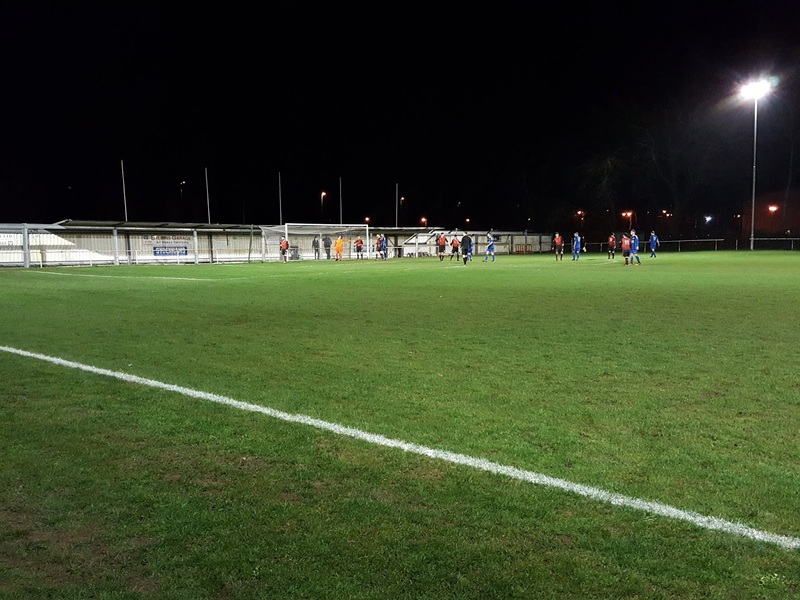 A free-kick into the area was cleared as far as Nathan Gray who's excellent looping half volley was acrobatically tipped over the bar by Charlie Philpott. Romsey were keen to kill the game off and shortly after this some good work down the byline by James Clifton concluded with him squaring for Dan Fox who shot low towards goal only for Sam Thompson to deny him. 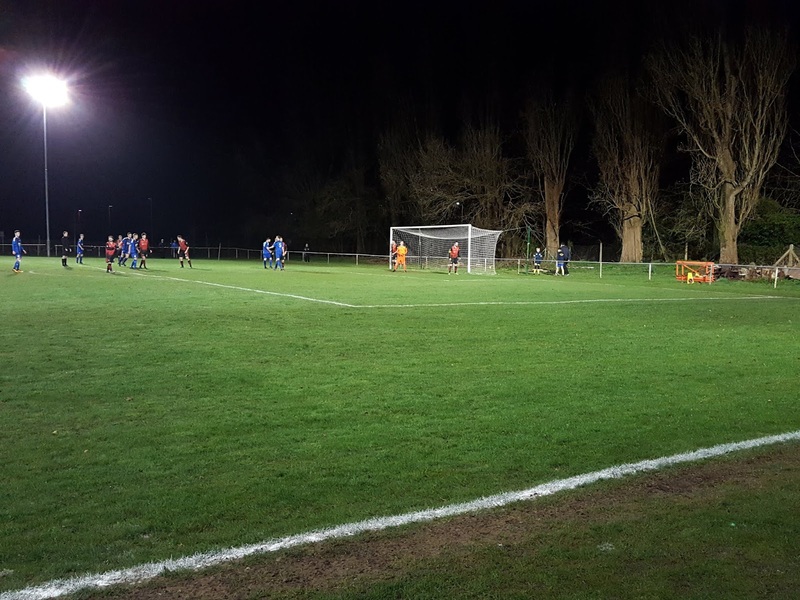 A comfortable game for Romsey meandered towards its finish and though Verwood did manage to get the ball in the net with five minutes to go it was ultimately ruled out for offside summing up their night.